Pet-friendly new South Haven, Michigan vacation rental for large groups. DOG FRIENDLY! 4 bedrooms, 2.5 baths, sleeps up to 12 guests. Includes pool & clubhouse access! DOG FRIENDLY! 4 bedrooms, 2.5 baths, sleeps up to 12 guests. Includes pool & clubhouse access! 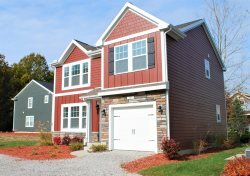 This modern luxury cottage at the Harbor Club of South Haven is contemporary, comfortable, and pet-friendly! Enjoy the quaint and quiet beach town of South Haven, Michigan with your large family or group of couples...and your best furry friend! The cottage has 4 bedrooms, 2.5 bathrooms, and sleeps up to 12 guests (plus 2 dogs). Enjoy granite counter tops, central air, a washer/dryer and modern appliances including flat screen TV, hi-def satellite with premium channels, WI-FI,and a gas grill. Great for several families or 4 couples. The main level of the home has a fully equipped kitchen, dine-in island, formal dining room, and living room with flat screen television and Queen sofa sleeper. The main level also has a half bathroom. Upstairs, the home has a grand master suite with King bed, walk-in closet, and large bathroom with shower/tub combo and double vanity. Also upstairs are 2 Queen guest bedrooms, a full hall bathroom, and a Twin guest bedroom with 2 sets of bunk beds (4 Twin beds). The upper level of the home has a full laundry room. A one car garage is attached and easily accessible for guests. Driveway parking space and parking space on the gravel shoulders of the cottage's private street are also available. Guests of Harbor Club are also welcome to take advantage of a member’s only facility and amenities; including the private marina, clubhouse and seasonal heated outdoor pool. The cottage is just 0.25 miles from the nearest beach access and 1 mile from downtown South Haven and larger, more public beaches. -Master Bedroom with private full bathroom, large closet, and TV.